Here you can find a strain description about Original Grape 48 and also some user-based reviews and infos directly from the SeedFinder (if available). You can also find the offers and auctions here if Original Grape 48 cannabis seeds are on stock at MyCannapot right now. Paul's very first strain released to the public in 2010, Original Grape 48 (Seedsman Purple Bud x Nirvana AK48) is a mostly sativa F3 hybrid (40% indica / 60% sativa) and the original strain without the genetics of Purple Kush added. The big sativa buds can be a little fluffy but extremely frosty. The strong grape aroma of the Purple Bud really comes through. LOUD grape aroma. Good for depression, stress, nausea or insomnia. 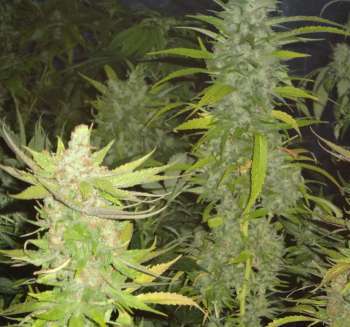 Flowering period is 9 to 10 weeks. Buy Original Grape 48 now at MyCannapot!